These textures would go well with Majestic Mountains! Great mod. What ENB were you using for the screenshots? Sorry. I made these in 2k. I recommend SMIM, RCI and ELFX with enhancer for an optimal immersion... ORGASMIC ! Ruins Clutter Improved. I had to ask first time I saw it too. Only Falmer textures for architecture is the huts and Falmer don't deserve Skyland. 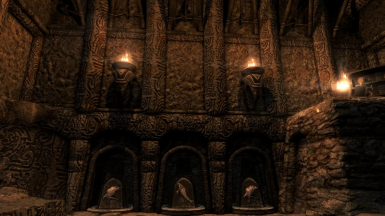 I've tried so many retextures for the nordic ruins, and none of them ever quite did it for me. Got a chance to test these in the game recently and they are absolutely beautiful. 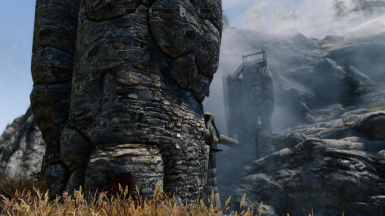 They maintain and enhance Skyrim's aesthetic and blend with the landscape just as old, lichen-covered stone might IRL. I think a lot of your texture work is severely underrated and deserves more love. Great stuff. Thanks k you. I really put a lotta love into this mod. There are a few more textures id like to add. It makes me sad Skyland mods are considered underrated. :( I thought they were doing pretty well. Oh no I meant comparatively when looking at other retextures on the Nexus. Maybe I'm just picky, but I prefer these to a handful of more popular texture mods on the Nexus. No offense to those mod authors, of course! You can't go wrong with these textures. I'm using all the Skyland textures and have had no issues at all. They look great and didn't cost me any FPS that I've noticed. Hey about your future mods, so I use MANY mods but my base of textures is not anymore Noble HD since you released skyland landscapes and riften/whiterun I have a blast with this textures design they are very cool and gives a good vibe to the game, I was wondering if you expand your work to other major cities in game and why not some day solstheim, keep up the good work. I'll get Solstheim one day when all of Skyrim is done. As of right now, only 3 dungeons, Solitude, Markarth, and Windhelm. At that point, all the architecture/landscape will be done. Other than that, it's just clutter which I don't plan on doing. Honest opinion here, but what happen, this is much lower quality than your other mods, this seems a bit rushed, the textures are blurry compared to your other mods. In CK, a lot of meshes are scaled WAY up to fill holes and gaps and for spaces to be larger. That stretches the texture. You see it with mountains too. Sadly I can't fix it unless someone made all new meshes. You could try HPP. This is my fave ruins retex, really like the details showing the carvings. nice work!